Sankhadip Das for coming up with the idea of transcribing Arun Shourie's main talk, writing the first draft, and sharing it with the forum. Others in the forum and then the HHG team have reviewed the material, which has gone through additional hours of editing. There remain tiny sections where the audio is unclear. We have highlighted certain key passages. The Youtube video is embedded at the end of this post. If a keen ear can spot key missing words, please add a comment and we will update the post. 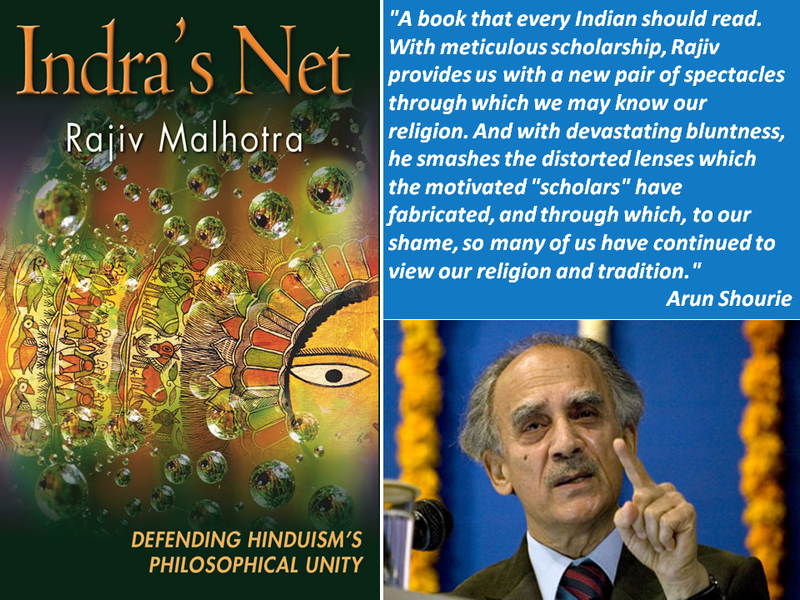 Arun Shourie delivered a thought-provoking and witty lecture on January 29, 2014 at the Vivekananda International Foundation (VIF-India) meet in New Delhi, while releasing Rajiv Malhotra's new book 'Indra's Net: Defending Hinduism's Philosophical Unity'. The written word is powerful and often remains embedded in our memory longer than the same information received by listening to a lecture. We hope this transcript will complement and amplify the experience of listening to Arun Shourie ji's video lecture on 'Indra's Net'. As in his earlier books, the three books, so also in this one, Rajiv has given us a pair of spectacles, a new pair of spectacles through which to understand, through which to see our own religions and our own tradition. He has done this with meticulous scholarship and with as much force, he has smashed the distorted lenses which were fabricated by so called scholars abroad and here and through which to our shame we had been seeing our religion and our tradition. So, it is a dual contribution he has made. And of course the book is full of facts, the book is full of documentation, but even more so it is suffused with very important argumentation. It is not citation mongering, just quotations from here and there or just alleging conspiracy theories. It is an argument that he gives us as to why it is that certain propositions which you and I may have taken innocently as just the findings of a scholar, why that proposition is being advanced. For instance, why is it that the church is afraid of the notion of immanence. Most of us would not have thought about it, but he gives us a deep reason as to why this is like this. Second is his plain speaking, because many scholars say things in convoluted ways. Very often they say it in such a soft way because they are still looking for careers or acclaim in the very circles that need to be exposed. Rajiv told me that his formulae, his attitude in this matter was, that what we do must be, to use this word ‘unignorable’. It is a wonderful word. But that does not mean abuse, that does not mean just a sort of torrent of strong words. It means that the kind of scholarship and documentation which he has provided. I know from scholars in the West that they are apprehensive if he walks into a room, in a conference on philosophy or religion or on Indic studies in the West. So, this book shows how tendentious his scholarship has been. Mr. Doval was just recounting some of these things but really he… if I may use the word, he shows that the scholars have really been sort of missionaries in mufti and how they have been insinuating certain notions in us, sowing the seed of that tree which will keep changing, but their tree also keeps changing in this way. And he documents the lengths to which they will go, if I may just read one passage. One of the chapters is devoted to a very famous scholar from whom,… who is very well cited in India by Indian scholars, Paul Hacker, and Rajiv tells us that when his collected writings were being published to mark his 65th birthday. These were most... many of his writings were on India, Indian religion, Hinduism and so on. I’m quoting he says that “acting on Hacker’s wishes, the editor of his collected works excluded the author’s polemical Christian writings from the compilation”. I have found the same thing in the case of Max Muller. If we see the four volumes of his letters…It’s called Sparks from the Smithy's or something [like that], those writings are just not known in India, but they set out a clear agenda and their hope in Brahmo Samaj as how it will be the lever by which India would be converted and their great disappointment when the very person on whom they were relying, went to Shri Ramakrishna Ji, and Ramakrishnaji changed him and he became a follower of Ramakrishnaji. So, Rajiv documents their tendentious scholarship and the lengths to which they will go. He documents so well the echo effect that they create. Woh kuch likhenge, yahan quote hoga, kyunki ab Indians bhi wohi kehe rahe hai, ya Hindu scholars bhi wohi kehe rahe hain, to woh Hindu scholar ko quote kar kar apni cheez ko aur bhi reinforce kar lete hain. And much of it turns on definitions. They will define a religion as something and thereby say, as Doval was, sort of reminding us, that Hinduism is not a religion as it has no central authority, no book, no prophet. Hamhari khasiyat hi yehi hai ki yey nehi hai. Kumbh mela hai, kisne start kiya hai, kaun uske piche hota hai. Pata nahin kitne 3 crores sey 10 crores log aa jate hain [Sabarimala mein 3 million go] or these kavadiyars. Nobody knows who has started the yatra, nobody knows who organizes it and yet it continues and nobody has been able to erase it. Now for somebody to define a religion as one that must have central authority, director, an authority sort of Supreme Court, which can pronounce something is right or not right, then you say that this is not a religion. But then you are surprised that it continues. Then you have to say, no but it does not continue, it is not there, it is something new, which is being created. This used to be the same thing till even the 1970s, that India was actually not a nation. The nation was also being defined in same way that which is one race or one language or one religion or a contiguous territory and then it turned out that none of those things helped many other countries at all. So, Rajiv does this. They can not comprehend and if I may quote a Western scholar whom Rajiv talks so well and about whom also I am sure he would have many things to educate us with . But Diane Eck in her wonderful work on ‘Pilgrimages of India’, she uses a sentence which is incomprehensible to many of the scholars. She says that India has been defined not by the writs and edicts of its Kings but by the foot falls of its pilgrims. Basically India was never united. Itne kingdoms the [Hindi], but, have you ever heard of a pilgrims procession being stopped at any border within it and those who are inside the tradition? Gandhiji, Ramakrishna Paramahansa soch bhi nahi sakte they ki aisa question [koi] puchega. Gandhiji ko dekh lijiye, Vinobha ko dekh lijiye unko – those who are steeped in the tradition, Vivekananda, they could see the essential unity and it is just the outsider who sees only the difference and in this Rajiv so well documents their double standards. You see the animosities among Christians sects, these Shias and Sunnis are killing each other. But Christianity, remains a religion, Islam, remains a religion, magar hamare yahan (in our case), when there is difference of opinion on things which are essentially unknowable, say between different ‘Sampradayas’ or between a ritual then, aise dekha nahin, ek religion hi nahi (this is not religion). Achha ek taraf hai ki ek religion nahi hai, there is nothing like Hinduism magar agar ek inscription apko mil geyi jismey ki aap infer kar sakte ho jo inscription mein nahin likha kyunki kisine kise local sect nay, kisi local jain temple ko appropriate kar diya toh aapne to dekha nehi. Hinduism is so intolerant that it took away the temples of the Jains; a religion which did not exist till just now! [laughter in the audience]. I’ve documented this in the case of many of these Marxist historians. Similarly Rajiv so correctly points out, this whole notion that of boundaries, boundaries between religions: that. these in our case are permeable. I mention here an example from a survey in Japan, in 1985. Writers have written, there is a book on this. People were asked what is your religion. So, 95% of them said we are Shinto, 76% of them said we are Buddhists. It couldn't be: because it was no different for them. It was completely Judaic, Christian, Islamic notion that you can either belong to this or to that. We are Hindus, many of the people, persons like me, all my reading is Buddhist, many of my practices would be from teaching of the Buddha but nobody would say that I am less of a Hindu or more of a Buddhist or vice versa and actually this notion was fomented in India and the first time this happened is in the Shiromani Gurudwara Prabandhak Committee Act. In that Act, ‘Who is a Sikh’ is defined. ‘Who is a Sikh’ – He who believes in the Granth Saheb, He who believes in the Ten Gurus. Most of us could be Sikhs from that point of view, therefore a new clause was added "..and who does not belong to any other religion". You and I may think it is just an administrative thing, but that seed is sown in 1925 and you see it in the agitations of Bhindranwale and others much later... as to what happens when these seeds come into being. And as Doval was just saying one of the essential things about that scholarship was that and…Rajiv does a wonderful job of documenting this that we can not do anything right. You see if we remain as we were, let us say we keep sacrificing animals, then we are fossilized. Hinduism is uncreative. If people come along and say no,no, sacrifice does not mean sacrifice of animals, it does not even mean sacrifice of your material assets alone, it means the sacrifice of your ego. That is Gandhiji’s Anashakti Yoga. Then…Neo Hinduism! This was never there. [laughter in the audience]. And as Rajiv points out that every Christian theology has actually been inventing a Neo Christianity, but nobody says that. So, if Vivekananda reformulates things so that it is relevant to the time, then he is just inventing. If they do something it is creative, it is renaissance, it is reformation. Not only that you see, there are contemporary accounts. We have one of the best people I know, knowledgeable on Islam and Islamic history or history of Islamic rule. Islamic historians, contemporary historians, court historians, writing accounts contemporary with the events are full of slaughter, of destruction of temples and so on. So, how is that to be explained? The word that has been used, I was quite surprised. They say that this proves that this was not being done. The accounts claiming that all this has been done by our great king, is because he was not doing this [laughter in the audience]. Why then did you write it? Because it was trying to table verbal virtue for him. But if that one inscription shows that after losing a wager, the Jains had to vacate a particular temple for the local Shaivites then it will be Hinduism will be intolerant and the ridiculous lengths to which people will go… Rajiv documents this in Swami Vivekananda’s case or in the case of other when they make ANUBHAV, direct personal experience as the criterion or as the mode, then that we are only trying to ape the West and ape Western Science. He asked was Patanjali aping Western Science or West? Was Ramakrishna Paramhansha aping the West or Western Science or Ramana Maharshi? So, in every one of these things I could go on with the details. It’s a book which is a must for every Indian. We must see our tradition through the spectacles that persons and specially Rajiv Malhotra has constructed for us. And it was a particular education for me because I had focused only on the Marxist historians and felt that they were regurgitating, sort of swallowing and vomiting what had been written by some Soviet historians. But I then now realize after reading Rajiv’s books that they were actually swallowing and vomiting what many of these so called Western scholars in America and in Austria, or Germany had written with a purposive agenda. The main lessons from this book, I’ll spell out three and I’ll sit down after that. One is, there is reason we should look to the future with confidence even in the religious sphere because in the case of Christianity, Rajiv points out, attendance is falling by the hour not even by the date. In places like Belgium, it has almost completely disappeared, the attendance in churches. Islam is tearing the Muslim world apart and even more important, it is a very important and a point of great insight which Rajiv has made that out of the religions, Hinduism and Buddhism, Indic religions are the closest to the spirit and substance of science. Just as the goal of science is the understanding of outer reality, its method is experimentation and peer review, its means is the laboratory, so also Indic religions are the science of the inner world. Their means is personal, direct experience and their peer review is unending and that is how the religion keep evolving and its method is entirely the scientific method of empirical verification through direct personal experience and the means… just that the means for those persons are laboratories and observations through instruments,... here a very good phrase Rajiv uses that the means, ours, was the living laboratories of these sages. They looked inside their own mind and came up with great formulations and great insights. So, time is on our side and we should do and we should work on these matters and practice our religion with great confidence. If something requires reformulation, we should reformulate it and say yes, we have reformulated it. Because this is the new formulation, this is what is required for the time. If we need to endow old words with new meaning we should do that with confidence. We must have and I am sure you will have after reading Rajiv’s book, a little contempt for these tendentious scholars. One, A library for India, and a library of India. We should aim for those but the prerequisite is that we should be like Rajiv Malhotra, we should know our tradition, we should know our religion. The reason on account of which this kind of fabrication has prevailed for so long is that we have not known our tradition, not known our religion and we have known these only through the eye, we have seen through the distorted lenses which were fabricated by these tendentious scholars, these missionaries in mufti. So, Rajiv, certainly on my behalf, and I’m sure on the behalf of every one, and on behalf of all of your readers Thank You. [prolonged applause. The main lecture ends here. Arun Shourie then has some interesting observations on how Indians misinterpret "Vasudhaiva Kutumbakam" (the whole world is one family). The HHG team has transcribed this portion for the sake of completeness and also because this segment has a very important message for the millions of gullible Indians wallowing in the myth of sameness]. It is not anti-christianity, anti-Islam or anything like that. It is, the book is, it's a wonderful thing both about cosmos and life, this metaphor of Indra's Jaal and also about Hinduism. Every part reflecting every jewel all other jewels. Therefore if anything is changed [or disturbed], it is reflected all over, etc. But he also makes a very important point in the end. Which illustrates... Rajiv illustrates both his style and forcefulness of his argument. It [is an illustration of what he was] telling us in the end. In our anxiety to be liked. we keep repeating words without understanding their implications. Humne Sabse pehle kaha 'Vasudhiva Kutumbakam' [comment on India's tolerance] .... Sari duniya to humne ek mana. So I will read to you where actually says where this word comes from [reading from pages 295-296 of Indra's Net]. "In one story in the Hitopadesa, a cunning jackal, trying to create a place for himself in the home of a naive deer says ‘Vasudhaiva Kutumbakam’ in his appeal to the deer. The deer ignores warnings from other animals, who caution that it is unwise to trust someone at face value without first ascertaining his history, nature and intent. Upon deceitfully acquiring the deer’s trust and moving in his home, the opportunistic jackal later tries to get the deer killed. Indeed, the moral of this story is that one should watch out for cunning subversives . Blindly trusting those who preach ‘universal brotherhood’ can lead to self-destruction. ...Bahasa is a creation of the Indonesian freedom movement in the 1930-40s. Mother country Italy ke bare me baat kar le [laughter in the audience]. Modern Italian is [Anderson] says modern Italian is a creation of the television age. But we are on the defensive ki saab, Instead of celebrating the fact, that yes, we have so many languages, we get defensive, and that's how this book is so invaluable. It takes us to the root of our defensiveness and that is ignorance about [our own systems]. Aur isi liye, bahut important hai ki Poison pill bhi fabricate karni chahiye, magar jo poison, jo dusron ki pills humne swallow kar li hai, aur repeat karte rehte hai Vasudhaiva Kutumbakam, uska bhi meaning asli mein dekhna chahiye! thank you for transcribing it. Prevent Digestion and Distortion of Holi!